Adilabad district of the state of Telangana. Adilabad is 20 km closer to this Mandal. The other capital of the nearest state Bheempoor is Hyderabad and its distance is 270.4 km. The other capitals of the surrounding states are Bhopal 399.5 KM., Daman 588.3 KM., Mumbai 594.6 KM. According to data from the 2011 census, the total population of Bheempoor is 1,767 in 391 households. The total population consists of 900 men and 867 women. 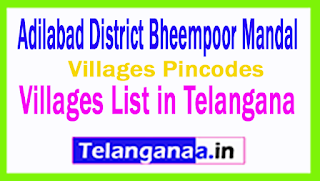 Pincode of Bheempoor Mandal: en 568959. 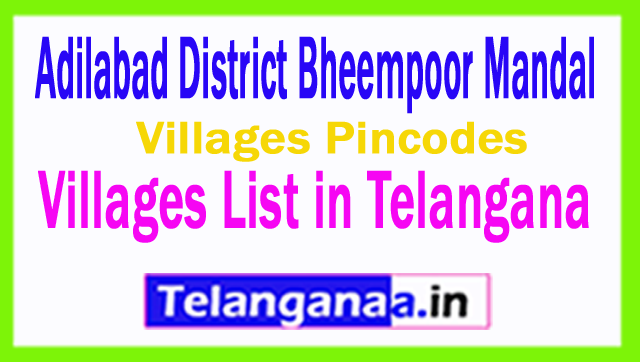 Here is the list of Bheempoor Mandal Villages Pin Codes.